Florida International University has expanded its footprint eastward with the inauguration of facilities on Brickell Avenue and Lincoln Road that are engaging the South Florida community and benefitting students, business and the arts. This fall FIU welcomed 46,000 students, its highest enrollment in history, and 141 new faculty members. The two new locations augment existing facilities on two campuses, two other centers and The Wolfsonian-FIU on Miami Beach. FIU is expected to add 2,000 students a year for the next five years and award 100,000 new degrees by 2020. The state-of-the-art facility at 1101 Brickell Ave., celebrated its grand opening Friday, Sept. 16, with a ribbon cutting. FIU Downtown on Brickell is home to several graduate programs in business, public administration and global governance, in addition to The Metropolitan Center, a public affairs center focused on economic development, land use, housing, and applied social research. FIU Downtown on Brickell also is home to the Master of Arts in Global Governance (MAGG), a signature degree offered this fall for the first time through the School of International and Public Affairs. FIU Downtown on Brickell encompasses 32,000 square feet of space that house classrooms, case rooms, faculty and administrative offices and dining facilities. The space was built to FIU’s specifications and displays reproductions from The Wolfsonian-FIU collection. Located in the iconic building at 420 Lincoln Road, the Miami Beach Urban Studios was inaugurated Tuesday, Sept. 20. Miami Beach Urban Studios houses graduate design studios for architecture, landscape architecture and interior architecture students, practice rooms for music students, exhibition and graduate studios for visual arts students, performance spaces for theatre students, and classrooms for communication arts students. 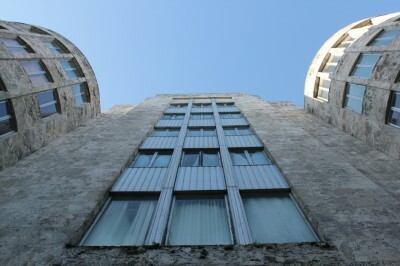 The Miami Beach Urban Studios also will be home to the newly established Office of Engaged Teaching, Scholarship, and Creative Activities, headed by Miami artist Xavier Cortada, who will work collaboratively with FIU faculty on initiatives to engage local businesses, artists, designers, cultural institutions, and governmental agencies. Dean Schriner noted that not only is the location of the studios at the center of the creative energy on Miami Beach, but the building itself is significant from an artistic and design perspective. Owned by long-time FIU supporter former U.S. Ambassador to Belgium Paul L. Cejas, the building is a shining example of 1940s Art Deco architecture. Starting at 6 p.m., an open house will follow the Miami Beach Urban Studios’ grand opening. The event will feature all of the academic units of the College of Architecture + The Arts, including performances by FIU School of Music and Department of Theatre students, an model exhibit from the School of Architecture, and a photography exhibit by FIU Department of Art + Art History that features faculty, students and alumni. FIU needs to stop enrolling so many students. The value of our degrees diminishes if everyone has an FIU degree. Enough!